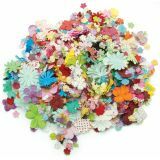 Wildflower Pillar Pack .5" To 2.5" 1.2oz - PRIMA MARKETING-Prima Flowers Wildflower Pillar Mix. This package contains seventy-two flowers in a variety of shapes and sizes. Packaged in a 7-3/4x3 inch plastic pillar jar. Imported.